Expanding Horizons Through Creative Expressions, a book by a Lexington native has been released. 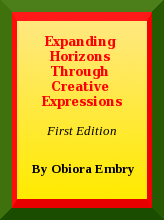 The book is a compilation of poetry (rhyming and non-rhyming), editorials, and essays that touch on diverse topics with the goal of expanding horizons. March 14, 2009 - PRLog -- Local entrepreneur, organic gardener, parent, Web developer, "green" thinker, writer, poet, and now, author, Obiora Embry, has completed his first book, which is entitled Expanding Horizons Through Creative Expressions: Reflections and Thoughts Related to the Struggle for Peace, Sustainability, Equality, and the Search for Humanity. The compilation contains poetry (non-rhyming and rhyming), essays, and editorials that were written between 1999 and 2006. Obiora's inspiration for authoring a book came in 1999, but it wasn't until May 2007 that he began to bring his idea to fruition. Obiora decided to not create a poetry book, but rather a compilation because he wanted to share some of his themed work with a broader audience...he felt it was way past time for US to expand our horizons and to change ourselves for the better. Even though this is the case, Obiora's book was put on the back burner until December 2008, when it was resurrected. A family-owned business that creates, publishes, and promotes original and creative books written by the Embry family. The books are diverse and cover a wide range of topics and are created with a sense of purpose, passion, and love for oneself and Gaia.